These are aerial photos, taken by Lt. Steven "Vito" Vitrella, of the Navy VFA-106 Gladiators squadron. The plane is the special F/A-18C 30th Anniversary Hornet used by the Tactical Demo Team for air show demonstrations. The plane is being piloted by Lt. Joe "Sharky" Capalbo on the trip back to NAS Oceana from the Robins AFB Air Show. The photos were taken using a Canon Powershot SD1000 on May 5, 2009. 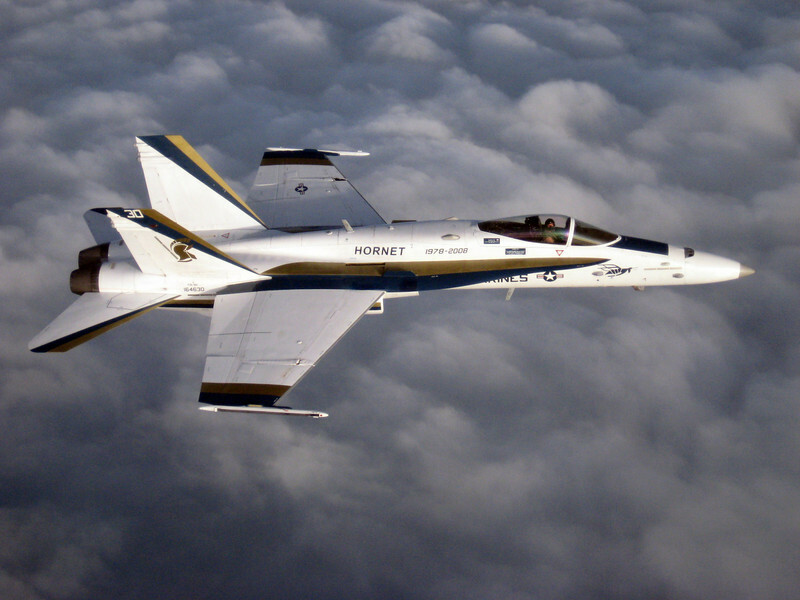 This aerial photos was taken by Lt. Steven "Vito" Vitrella, of the 30th Anniversary Hornet. The plane is being piloted by Lt. Joe "Sharky" Capalbo on the trip back to NAS Oceana from the Robins AFB Air Show. The photos were taken using a Canon Powershot SD1000 on May 5, 2009. Great Shot! I've seen them perform.